As winter departs and spring sets in it's time to get your yard cleaned up. A healthy, green lawn can go a long way to last through the hot summer months we have here, in Ada County. Professional and reputable lawn care services do not need to be expensive to be excellent. Aloha Lawn, Tree, and Pest deliver superb professional lawn and yard maintenance at an affordable rate. Aloha has maintenance packages designed for lawn care services to get your lawn in shape again. 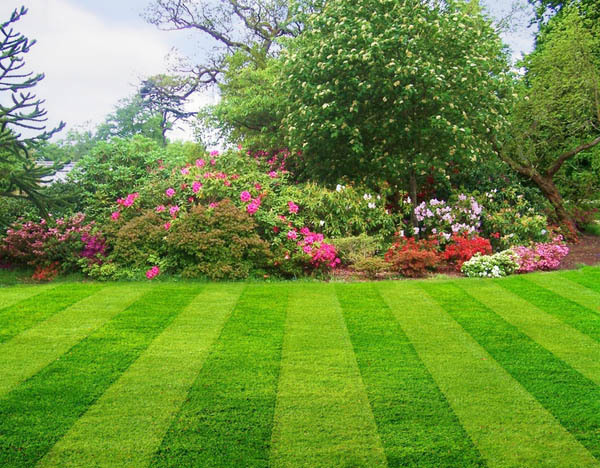 When you set up regular lawn maintenance services with Aloha, you are guaranteed a dedicated team of professionals, whose number one goal is your satisfaction. A healthy well-maintained yard is a charming space to spend time with friends and family. Eagle is known for long, warm summer nights, let Aloha Lawn, Tree and Pest create an inviting yard for you to enjoy throughout summer and fall. Aloha Lawn, Tree, and Pest have customizable lawn care services for the Eagle, ID area. Whether you are looking for a one-time beginning of season service, or a long-term, regularly scheduled, maintenance we have the services you are looking for. Reduces thatch buildup and allows water and nutrients to get to the roots of your lawn. Grass seed has direct contact with the soil which encourages the growth of your lawn by stronger, well-established roots. Our pet and people safe fertilizer is a slow release blend specially formulated for this region of Idaho. It is designed to provide optimal nutrition and reduce weed occurrence for your lawn. Fertilization should be applied at least twice a year for the best results. Repeated applications of fertilizer will keep your lawn green and healthy from early spring into late fall. The best defense against weeds is a thick and healthy lawn. A proper weed spraying of your lawn will increase water uptake, and build the vitality of your lawn, producing a more robust lawn that will withstand the heat and drought the summer brings. Our team knows the best time of day to mow, and how long the blades of grass should be for each season. Short grass in the spring allows water to get to the roots, which strengthens your turf. Longer blades in the summer protect from the heat and keep moisture in the soil. Our pest spray application will manage infestations of bugs common to Eagle, ID. Grubs, ants, Japanese Beetles, billbugs and other pests won’t become an issue in your yard. Aloha Lawn, Tree and Pest is a local, Idaho company. We live here and love this community. Let our expertise in the landscaping and lawn care industry work for you. Allow our dedicated team to take the hassle of lawn care off your shoulders this season. Add some free time back into your schedule and have the best-looking yard on the street with Aloha’s lawn care maintenance program. Call 208-995-2443 to inquire about our services.